Tagged under Arina Tanemura, Series. The Imperial Academy is famous for its Elite Student Council, special privileges and Bronze, Silver and Gold rankings. However, the Platinum rank was introduced, given by the leader of the Student Council, to she who is "special" -- she who will be his girlfriend. Enter Haine Otomiya, whose love for Shizumasa Tougu has driven her from a rebellious past to enter the Imperial Academy. But upon seeing her love, he pretends he has forgotten her. What happened to the once sweet, gentle, and kind Shizumasa? What has changed since she last knew him? One of my shoujo manga favorites and one of the mangas that I wish were made into anime. I read this series a long long time ago and remember wanting to read it again when I have free time. I really love the plot and the characters. I also liked the twist about the Tougu family and Haine's family. This manga revolves around bitter and sweet love stories, hidden pasts and mysteries. Recommended to those who want to read some dramatic romance. this is a great manga, but I've seen the anime and well its too "below" of my expectations . 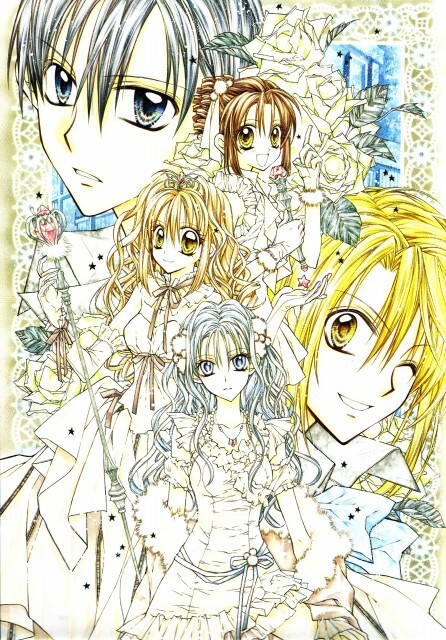 the manga style is much more better ..
and may I said about this, Arina's shoujo is beyond compare. It's sweet, cool, complicated and have a very deep thoughts . The story is quite confusing, at first. But if you dig in and continue reading (and finish the series), then you'll see that the story is really well planned. I like the twin concept and the story is quite unusual. It's great, but sometimes I get confused with the characters because they look alike (for the twins and for the other girls).